Black French Bulldog Dog. Charms occupational jewelry clothes hanger gold. 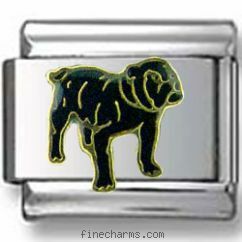 Our Animal collection is enriched with Black Dog Italian charm. The image is raised over a glittering stainless steel support and is distinguished by a milti-colored combination of black enamel, aureate casing and silver toned backdrop. This dog will stand guard over you but you can fearlessly link other charming creatures for your personal bracelet – he'll never attack first. Compatible with 9 mm Italian charms.